If I think back to my practice a few years ago (as I’m getting older) there is no doubt that the number of CT scans I’ve performed from the ED has increased. In both my adult and paediatric practice the indications for CT have increased, the ease of obtaining a scan has decreased and as a result I’ve almost certainly delivered many more mSieverts in the last year than say 5 years ago….., but does this matter? On the one hand I’ve picked up a lot more pathology, and probably at an earlier point in the diagnostic process. In trauma we have seen the advantages of the Afghani-scan (full body CT) and early CT brain protocols has undoubtably led to earlier identification of surgically treatable bleeds. So, there are lots of positives, but there are also some negatives and one of these is the increase in the overall dose of ionising radiation to the population and the potential for the increase in cancers. Now, this is a difficult area to study as you need a lot of time and good record keeping, but it can be done. [learn_more caption=”What did they look for?”] This is an observational study. 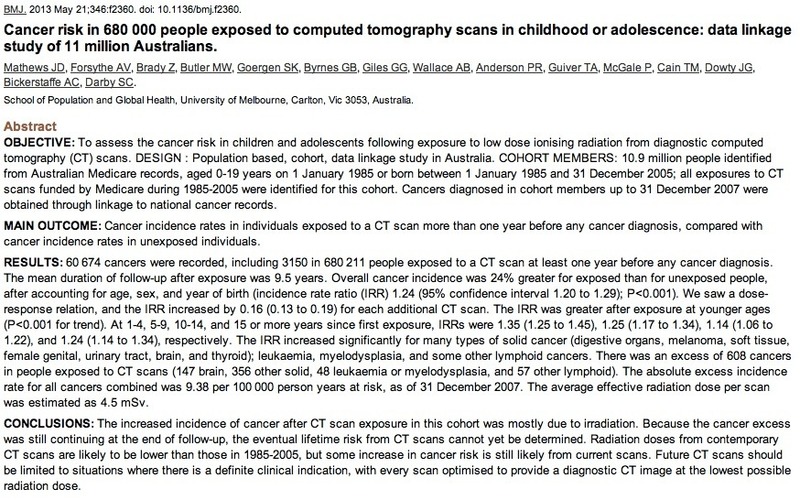 The authors were able to identify patients who had scans in Australia through their medicare system, and similarly they were able to identify patients who developed cancer. So, if a patient was scanned between 1985 and 2005 they were included, and they were followed as a cohort up until the end of 2007. So different patients were followed for different lengths of time, some patients had more than one scan, different sorts of scans were done, and different cancers were found. There is at first glance a fair bit of variability here, but it can be dealt with in the analysis. [/learn_more][learn_more caption=”The headline figure says a 24% increase…WOW!! !”] Beware of headline figures. The 24% increase in the incidence rate ratio (IRR) means that they saw more cancers in patients who had CT scans. However, this is a 24% increase in what is actually a really low incidence (the editorial is much better at explaining this the an the paper and I’d recommend reading it just as much as the paper). They also found a dose response, so the more scans you received the greater the risk. In real terms the editorial gives some great figures that we can work with. For example for a 2mSv scan (e.g. head) we are looking at one additional cancer for every 4000 head CTs in childhood. That seems low, but not great if you are the one in 4000. Another interesting statistic here is the overall excess cancers in the entire cohort (over 10Million) is just over 600. [/learn_more][learn_more caption=”So should I stop doing CT scans then?”] You are a clinician. This paper is really great, very interesting and helpful in quantifying risk, but just like the papers telling us to do more CT scans are only one side of a story, so then this is a paper that only gives us one side of a debate. I think it’s great that we understand the risks better, but as a clinician I still need to balance the benefits of better/earlier diagnosis against the risk of cancer. [/learn_more][learn_more caption=”Risk proximity”]I have a blog post in the risky business series coming up about this as it’s an interest of mine, but this paper allows us to think about risk proximity. As a clinician and patient the risk of missing a diagnosis right here and right now feels close and dangerous. The risk of cancer is something that will happen much later and for the clinician it does not exist. Clinicians will not feel that risk, nor probably ever even know about it. However, clinicians will feel the risk of a missed diagnosis, and so in our mindset the chronologically proximal risk prevails and potentially clouds our thinking. 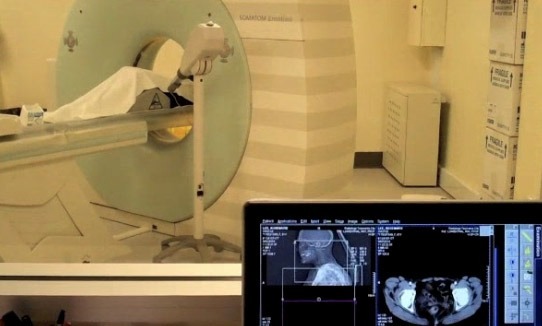 I’ve more to come on this so I’ll leave that though with you for now…..[/learn_more][learn_more caption=”Any way I can help my patient understand this?”] I am guessing that at least one UK newspaper will have a headline that says ‘CT scans give you cancer’ this weekend. I love these data visualisations / infographics. They are the easiest way of getting patients to engage with information, and as conduits between pure data from studies and patients we should be engaging with them. Also, re the above study, it would be really great to see a NNT as well as a NNH. How many of the CT’s saved or improved quality of life. A more balanced argument. I think is just the other side if the argument, we have loads of papers about scanning more, this helps us realise that there are counter arguments and starts to quantify them. So this cannot give us an NNT or NNH, but what paper could? I suspect that humans are terrible at assessing probability. While we can rationalise odds intellectually but at the end of the day bookmakers, lottery companies and the government continue to make large sums of money. In Our department the consultants still have to have the conversation with our colleagues in radiology to arrange CT scans and future cancer risk always comes up particularly when requesting full body scans for trauma. I agree that risk proximity is a major factor when we are dealing with unknowns when assessing injured patients. In Emergency Medicine we state risk of missing injury and Radiology counter with the Cancer risk. Often an individual clinicians thought will be “I don’t want to be criticised for failing to diagnose an injury early in the patient’s journey” and the radiologist will be aware that if a CT is performed there is a risk that they will misinterpret the pictures. I am still uncertain what the best solution is. Protocols help individual clinicians because they allow the risk decisions to be taken in advance – unfortunately because doctors find avoiding risk proximity so comfortable we find patients getting pushed through protocols unnecessarily. Nsaids use is related to cardiovascular risk and CT scans cause cancer yet both are extremely useful and improve clinical outcomes when used appropriately. Getting beyond the headlines to managing the risk is definitely a challenge.